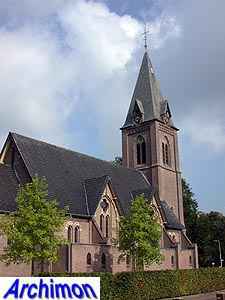 Petrus J. H. Cuypers, also known as Pierre Cuypers, was responsible for the design of many churches in neo-Gothic style in the Netherlands, and as such is one of the leading figures in the proces of catholic emancipation in the second half of the 19th century. He was born in a family where an artistic interest was encouraged. Cuypers' father was a merchant, as well as a church painter. Beginning in 1844, in a time when education of arts in the Netherlands was at a miserably low level, he studied architecture at the Academy of Fine Arts in Antwerpen, Belgium. Among his teachers were Frans Andries Durlet, Frans Stoop and Ferdinand Berckmans, pioneers of neo-Gothicism in Belgium. 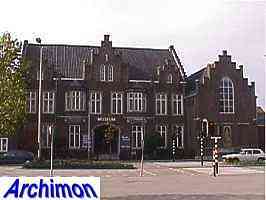 Cuypers completed his study 1849 with the best possible results and returns to Roermond as a celebrity. In 1850 he made a journey through the German Rhineland, where he visited the completion of the cathedral of Cologne. Ca. 1854 he attended classes by the French restoration-architect E.E. Viollet-le-Duc, who became one of Cuypers' friends and a major influence in his entire career. 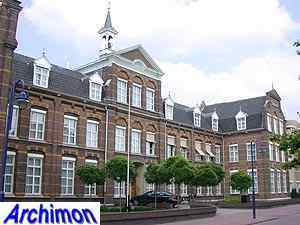 Back home he became Roermond's town-architect. Cuypers was the man who brought craftmanship back in the Netherlands' architecture. His office became a school for many architects who were taught all skills of the profession. 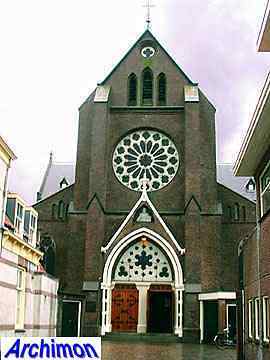 Besides this, he also participated in a factory for religious art, Atelier Cuypers-Stoltzenberg, that provided complete church-interiors and was founded in 1852. Besides designing new churches and other buildings, Cuypers also was responsible for numerous restorations of existing churches, including those of many medieval, now protestant churches. His attempts to restore parts of such churches back to their original state occasionally was a cause of conflict with the protestant community that used such a church. Apart from his architectural work, Cuypers was a gifted artist in other respects too, and his work includes several important monuments, tapestries and a piano, a gift to his second wife. Although Cuypers' churches usually are of a high quality, there are many reasons for criticism. Like most architects of that time, Cuypers had no problems with sacrificing the authentic look of a medieval church and replacing it with his own typical style, or even completely replacing a centuries-old church by a new one. 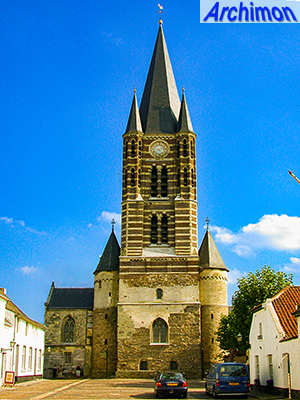 Small villages saw their small churches replaced by cathedral-size constructions, and a church in Romanesque style could easily become a Gothic one if Cuypers decided that would be appropriate. He was convinced that his designs could compete with the greatest Gothic churches in France and probably were even better, and likewise thought a restoration was a good opportunity to 'improve' a church's appearance, reason why his restorations have often been called falsifications since. For Cuypers churches and other old buildings were not simply reminders of the past, but objects that still had a function. On advice of his friends, catholic writer, poet, art critic and future brother-in-law J.A. 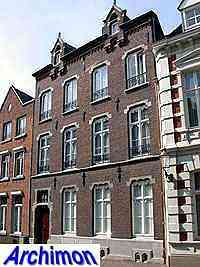 Alberdingk Thijm and French architect and expert on Gothicism Viollet le Duc, Cuypers moved to Amsterdam in 1865. The official reason Cuypers gave was that he needed a more vibrant and artistic environment. 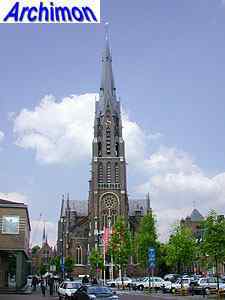 In reality, the controversy over his restoration of the Munsterkerk in Roermond will have played a role in this as well. This also gave him an opportunity to escape from the competition with his rival Carl Weber. In Amsterdam he built some of his most ingenious churches, forced by the limitations of the available space in this formerly protestant city. Besides, he also built several houses here. Although still the master of neo-Gothic, in Amsterdam he started to add Renaissance elements to his more profane designs, like the central station and Rijksmuseum in Amsterdam. These two buildings are among his most controversial designs, as many protestants were outraged that a catholic, a second-class citizen in their eyes, was commissioned to design two buildings that were regarded as being of national (read: protestant) importance. It's ironic that with these two buildings Cuypers in fact invented the neo-Renaissance style, which became very popular mainly in protestant circles. In 1894 he returned to his hometown, where he died in 1921, after having worked behind the scenes for his son Joseph Cuypers for several years. Cuypers' career can be divided in two periods. 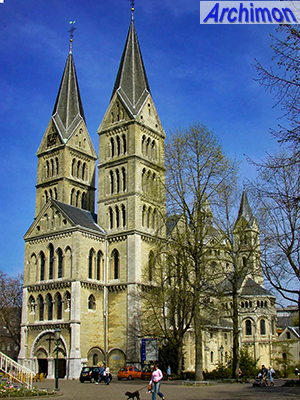 In the first period, the architect mostly built neo-Gothic churches which are highly influenced by 13th-century French Gothic and , to a lesser degree, Rhineland Romanogothic churches. Alberdingk Thijm urged Cuypers to fully study the Gothic architecture of that period, in his eyes the last truly catholic architectural style, which must be the starting point for the development of a new one. Like their never had been a Reformation. Cuypers' marriage with Alberdingk Thijm's sister further increases the bond between the two. The second period of Cuypers' career is the more interesting one. From the 1870's, Cuypers starts combining his style with other influences. His knowledge of the national Gothic styles increases, especially as a result of his being appointed to national advisor for monumental buildings in 1874, his friendship with Victor de Stuers, an activist for the protection of historical buildings, and the expansion of the railroad. Also of importance is the St. Bernulphusgilde ('Guild of St. Bernulphus'), a group of religious artists the most important of which is architect Alfred Tepe, which is so powerful in the archdiocese of Utrecht that Cuypers has no choice but giving in to their demands if he wants to get commissioned in this area which covers a large portion of the country. Other interests in this period include the Gothic styles of England, Scandinavia and Italy. Cuypers was respected outside his country too. In 1870 he is appointed Dombaumeister of Mainz and advisor of the archbishop in architecture matters until 1877. 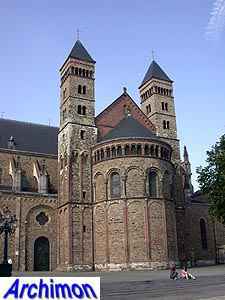 In this function he restores the east part of the cathedral of Mainz, as well as restoring several other churches and building a few new buildings, until in 1877 Joseph Lucas, also from Roermond, succeeds him. In Belgium he builds two churches and completes or restores a few others. Sadly, today Cuypers is usually remembered as 'the architect of the central station and Rijksmuseum in Amsterdam'. Many of Cuypers' more important designs have already been demolished or otherwise destroyed, but many still remain. Many of his drastic restorations have in part been made undone as the result of a change of taste. The following is an attempt to show some insight in the man's architectural work, and although the list will probably always be incomplete it is sure to expand. Emphasis is still on churches, but Cuypers' profane work will be added to this page gradually. The list of restorations is probably very incomplete. Pictures positioned to the left are Cuypers' own designs, pictures to the right are restorations. The list is in an as much as possible chronological order; due to the fact that the various sources do not agree on many dates making a good chronological list is a virtually impossible task no guaranty about its correctness can be given. Cuypers' first building, a symmetrical presbytery. Unplastered brick house built with details in neo-Gothic style. Cuypers own house and office, a building in an imaginative neo-Gothic style. 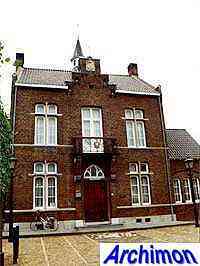 Now municipal museum with special attention to Cuypers life and work. Cuypers' first church. Basilican church in classic Gothic style. Choir slightly wider than the nave. Destroyed in 1944 and replaced by a new church in 1954. Is said to have had stone vaults, the first built in this country in centuries. No further details available. 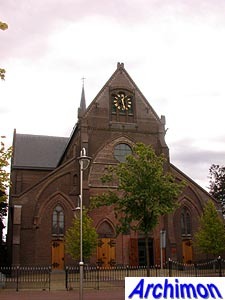 The oldest surviving church designed by Cuypers is a three-aisled cruciform basilican church. 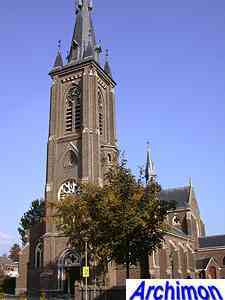 The tower is a preliminary study for that of the St. Martinus in Maastricht, which was built two years later. Church was not consecrated until 1867. Now a museum of religious sculpture. U-shaped complex. Chapel with lateral chapels and steeple on top. Cuypers' first church built in a city. Winning entry in a competition. Three-aisled cruciform basilican church in neo-Gothic style, inspired by French 13th century Gothicism. 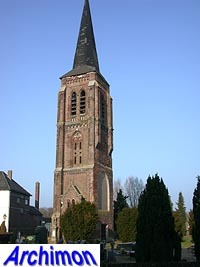 The tower is a further developmentment of the design for Kranenburg. Cuypers intended to give the church wooden vaults, but a government advisor suggested brick vaults instead. Cuypers' biggest church so far. It replaced a small village church and was actually much too large for its parish. Cruciform basilican church inspired by classic 13th French Gothic. Choir with ambulatory and radiating chapels. The tower shows influences from that of Chartres. Cuypers' use of brick vaults in this church established his name as an architect nationwide. Like the tower, the fronts of the side-aisles were originally extensively decorated with natural stone sculpting. Building in simple neo-Gothic style. Neo-Gothic one-aisled church. The 15th-century tower of a predecessor was preserved, but in 1890 restored in neo-Gothic style by the same architect. 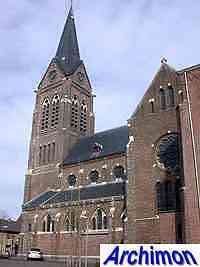 Three-aisled neo-Gothic church incorporating a short Gothic tower. Destroyed in 1944. 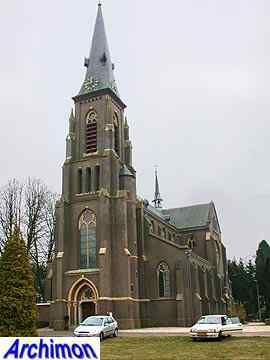 Neo-Gothic church, inspired by early French Gothicism, incorporating an older tower. Cuypers gives this building stone vaults, although wooden ones were intended. The use of inferior materials necessitates repairs to the vaults in 1898. The church was destroyed in 1944. Three-aisled neo-Gothic cruciform basilican church, incorporating a 15th-century tower, which is heightened with one storey and given a new spire. Nave and transept have a wooden ceiling, while choir and side-aisles have stone vaults. Transept has large rose-windows. Restoration of a medieval monastic church. Restoration of the choir. Demolished. Three-aisled cruciform basilican church, after the fourth trave five-aisled. Inspired by French Gothic. Three-aisled transept. Choir with rectangular lateral chapels. Central aisle and transept have wooden vaults, choir and side-aisles have stone vaults. Oeiginal design included a tower with corner turrets and octagonal upper segment. Cuypers also designed the presbytery. Restoration included the replacement of the upper segment of the tower. The previous one was lost by fire. Cuypers introduced a type of tower he would frequently use later on in his career; on a square segment, with small turrets in each corner, stands an octagonal segment which is connected to the small turrets by 'flying buttresses'. The whole part is executed in marl. A spire was added in 1874. Three-aisled cruciform church in sober early Gothic style. Clerestorey with small windows. Pointed wooden barrel-vaults. Three-aisled cruciform basilican church in neo-Gothic style. Demolished in 1959. Three-aisled cruciform basilican church. With its two unequal towers that both carry some very imaginative decorations and many elements taken from French Gothic at the rest of the building, this is a typical example of Cuypers' interpretation of Gothic, and a highlight in his career. Much of the looks of this church is the result of the ideas about symbolism as propagated by catholic writer J.A. Alberdingk Thijm. The towers, both inspired by the one in Chartres, represent the 'Tower of David' and the 'Ivory Tower of Mary' respectively. Choir with ambulatory and radaiting chapels. Rose-windows in the facades of the front and transept. Cruciform basilican church in French 13th century Gothic style. Extensions to the transept and chapels around the choir appear to be later additions. 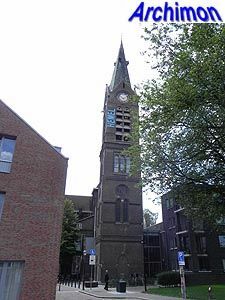 The first of six churches Cuypers built in Amsterdam. The building is unusually tall, in order to be visible over the surrounding houses. 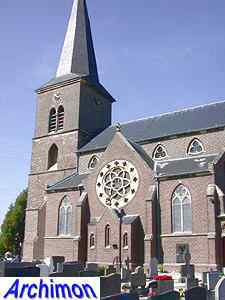 Influenced by the Romanogothic churches of the Rhineland (especially the Munsterkerk in Roermond) and to a lesser degree, the Ile-de-France. Cloverleaf-shaped choir and transept. For the first time in his career, Cuypers uses a crossing-tower, which in this case is octagonal. Front with two additional towers and rectangular transept added in 1887-1889. The original plan included a Romanesque-type of westwork flanked by two stair-turrets instead. Now an office-building. Restoration executed in two periods: 1860-1870 and 1886-1892. Among others: restoration of the crypt in 1881, the replacement of the western towers and the addition of a neo-Gothic spire (lost by fire in 1955) in between the two western towers in 1886. 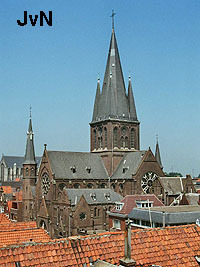 Cuypers' use of a red sandstone for the apse and eastern towers has been criticized. This is a part Romanesque, part Gothic church, executed mostly in marl, that used to belong to an abbey. A missing stair-turret was reconstructed, while traceries were added to the gables of transept and side-aisles. The most obvious change however is the completion of the Romanesque tower, of which only the lower part had survived, with several neo-Gothic segments of brick, with marl layers for decoration. This tower was completely destroyed in World War Two, but reconstructed according to Cuypers' plans later. Also a window was added to the Romanesque lower part of the tower, spoiling its traditional closeness. The rest of the building was mostly left intact. Cuypers designs a five-aisled church with dome and four towers to replace an older church. Only the transept is built, which itself is again demolished when after 1901 another architect builds a new, smaller church. Incl. the addition of spaces on both sides of the choir. Small neo-Gothic hall-church without tower. 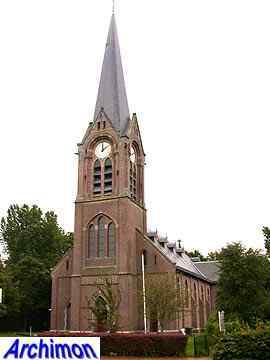 In 1926 replaced by a new church by Jan Stuyt elsewhere in the village, and demolished a few decades later. Three-aisled cruciform basilica built on a small piece of land. To save space Cuypers designed a church with a narrow central aisle and wide side-aisles with storeys. Wide facade with stair-turret. Big transept and choir. Clerestorey with circular windows. Square crossing-tower with octagonal spire and corner turrets. Inspired by early French Gothic. Closed in 1974, demolished in 1985. One of the most radical of Cuypers' restorations was executed on this late-Romanesque church, which was drastically altered to Cuypers' views. New additions included the two large towers at the front, while the two smaller square towers at the back replaced the original, shorter octagonal towers. An 18th century bell-tower was completely removed. Destroyed in 1944. No further details. 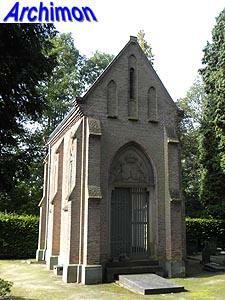 Small one-aisled chapel in neo-Gothic style. Three-aisled cruciform church with transept extending the width of the nave. Tower on most western trave of the northern side-aisle. Restoration and addition of a southern side-aisle to a Gothic church. 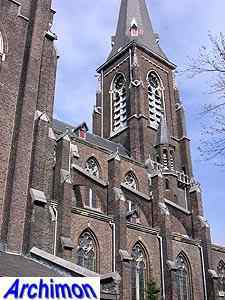 In 1885 Cuypers replaced the facade and added a polygonal tower. Destroyed 1944. Cruciform basilica in early Gothic style. In 1944 heavily damaged but restored to its original form after the war. 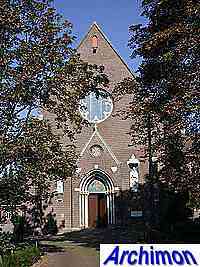 In 1962-1963 the transept was enlarged. Five-aisled cruciform basilica with round windows in the central aisle. Square tower on the crossing. The wo towers at the front were never completed. 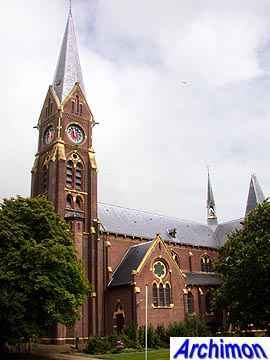 Became in 1876 the cathedral of the Breda diocese. Demolished 1969. No further details. Another restoration followed in 1899. 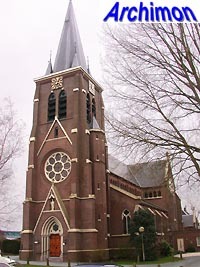 Cuypers already designed a church for Melick in 1853, but construction does not start in 1867. 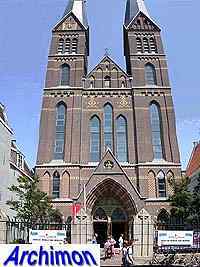 In 1882-1884 side-aisles are added to the church by architect Bolsius, completing the basilica-shape as Cuypers had intended. The church is destroyed in World War Two. 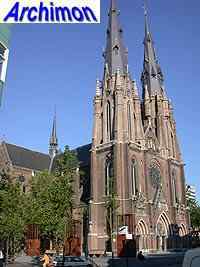 Three-aisled basilica in neo-Gothic style. Built-in on three sides. Short rectangular choir, pseudo-transept, octagonal crossing-tower. The brick vaults were the first in Belgium. 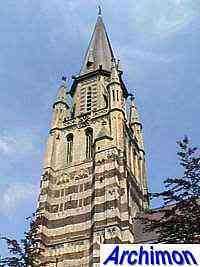 A complete departure of neo-Gothic was the design of this church in Oudenbosch, Noord Brabant. Essentially, it's a scaled-down copy of the St. Peter in Rome. The facade is copied from the St. John Lateran in the same city and was added by architect G.J. van Swaay in 1892. For the design of this church, Cuypers stayed in Rome for a while to study the St. Peter in detail. Three-aisled neo-Gothic cruciform church that is built as a basilica, although the entire nave is covered by a single saddle roof with dormer windows replacing the clerestorey, which for some reason were removed in 1969 and replaced by simple glass windows. The (pseudo-)transept is lower than the nave. The choir originally had a square apse, which in 1904 was replaced by a polygonal one designed by Cuypers' son Jos and Jan Stuyt. The original plans for this church can not be carried out because of lack of sufficient funds. 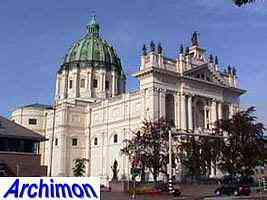 As a result of this a standard neo-Gothic cruciform basilica is built. Construction does not start before 1874. The tower is finished in 1890. 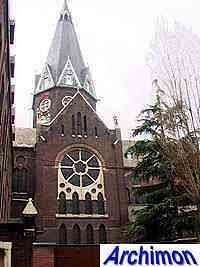 Originally a one-aisled neo-Gothic church. In 1937-1938 side-aisles were added by architect Joh. H. Sluijmer. 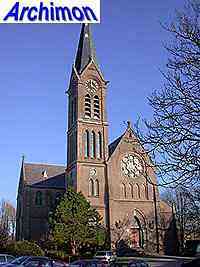 The church was not consecrated until 1884. 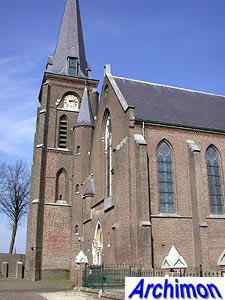 In many ways a smaller and simplified version of the church in Ouderkerk. Cruciform basilican church of moderate height, with round windows in the clerestorey. Tower at the southern side-aisle. Transept lower than the nave. Demolished 1962 with the exception of the tower. New neo-Gothic tower for an older church. Church destroyed in 1944. Restoration of a three-aisled hall-church and extension of the northern aisle. Destroyed in World War two. Cuypers adapts his original design for a church in Baarlo, which was inspired by the church of Nieuwstadt, for this new church. This is a cruciform basilica with round windows in the central aisle. In the 1950's the choir is demolished and the church enlarged. 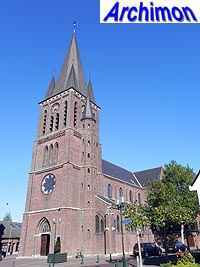 This first of seven churches Cuypers would built in the predominantly protestant province of Friesland was already designed in 1867. Cuypers took many elements from his disapproved first design for the church in Sappemeer (Gr). Three-aisled cruciform basilican church. Round windows in the clerestory. To save space the buttresses were built on the inside of the walls of the side-aisles. Wide nave which was not completed. The transept is high and wide. The design included a tower which was never built. Big complex in neo-Renaissance style.